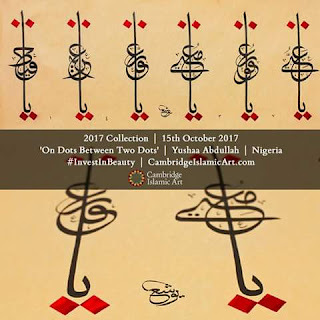 The first artwork is titled "On 2 dots between 2 dots" is a collection of six beautiful names of Allah selected based on their number of upper dots. 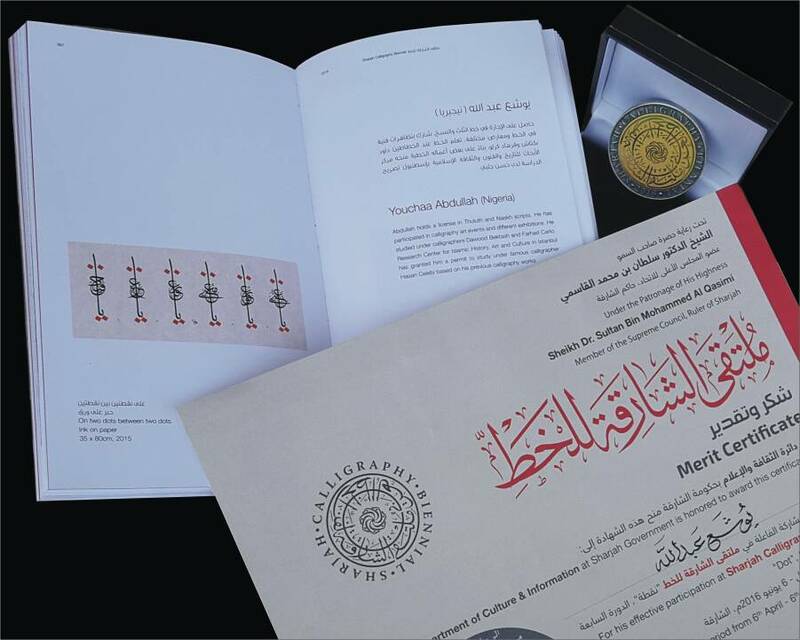 The artwork was produced to title with the theme ("Dot") of an exhibition of Sharjah Calligraphy biennial 2016. It was sold for £2000. The second artwork is titled " White Tulip" (Al-Gaffar Jalla Jalalah). 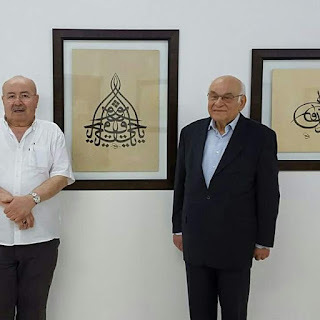 It is also one out of 6 beautiful names of Allah from the artwork titled " White Tulips " and was sold for £1500. My previous workshops brought a great awareness to the public about the importance of Arabic calligraphy and upgraded the level of its appreciation in our society. Most of my students were inspired to enrol into the full learning process through such workshops and three among the most senior students have successfully completed the curriculum. 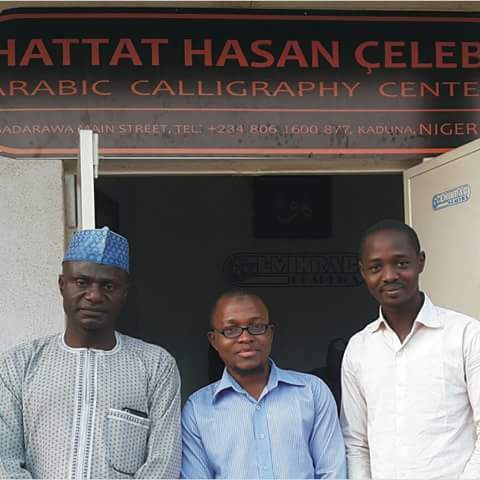 Soon, we shall have additional three Hattats in Nigeria when they receive their Ijazas (Licences). I have attended more than five international exhibitions where all artworks exhibited were sold, Alhamdulillah. 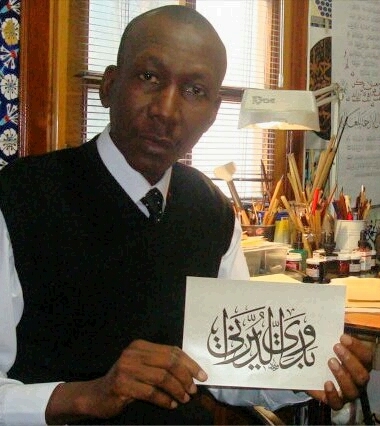 His tips for calligraphy students. The most important aspect about the learning process is one's passion for the art. 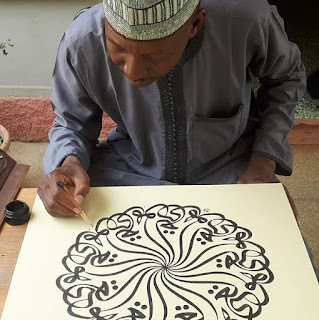 It should be taken as a hobby other than profession because it involves an intensive practice and assignments and can only be endured by a passionate student. 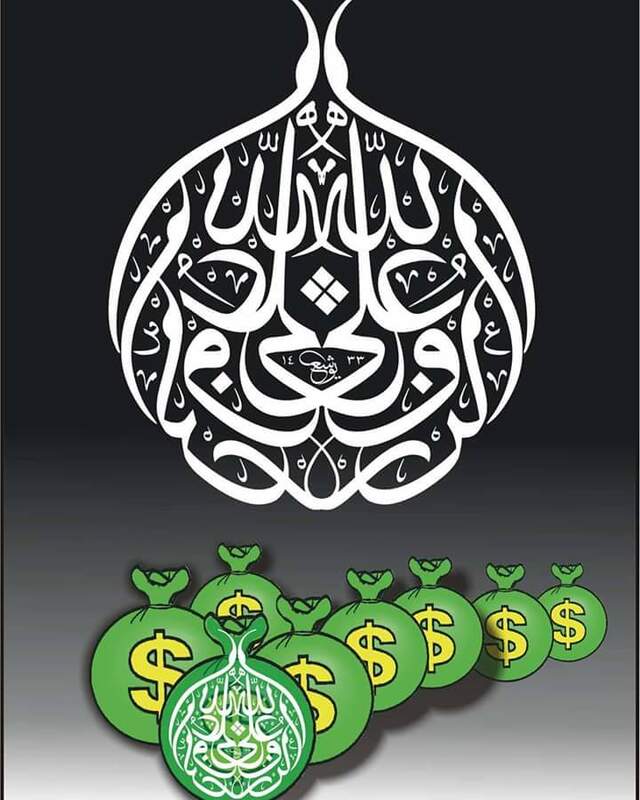 Yushaa Abdullah stands beside his "Trees on plastic"
Money bag. 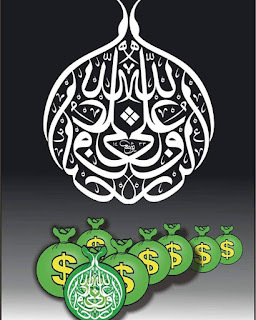 Wealth comes from Allah. Hardworking students like are the pride of their teachers. Keep at it. I am proud of you too, Ibrahim Jimoh. Happy to see your school progressing well Yushaa! Your works are amazing! Thank you so much for your encouragement and believing in me. Alhamdulillah, am proud to be one of his students. I hope Arabic calligraphy gain more footing in Nigeria 😊. 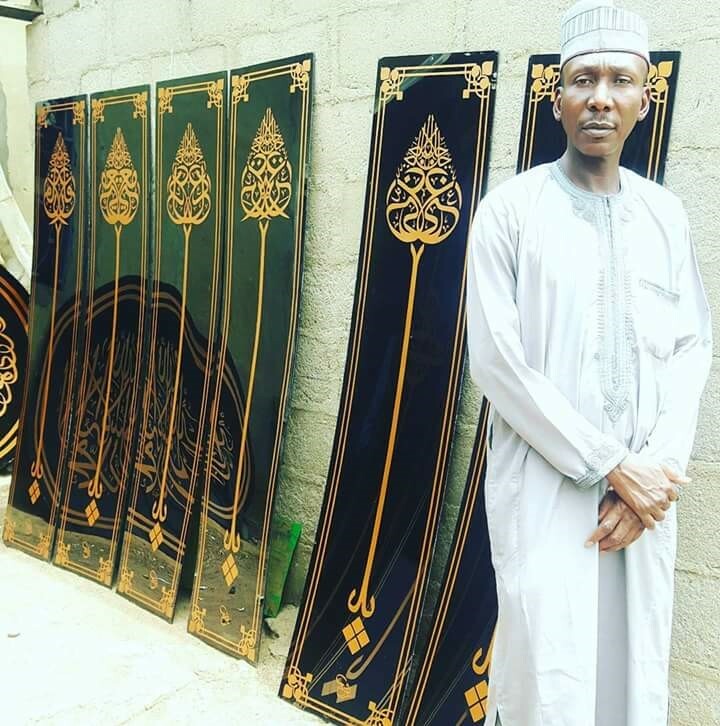 Hattat Yushaa Abdullah is proud of all his hardworking students too. Amin. I am also proud of you Sumayyah. 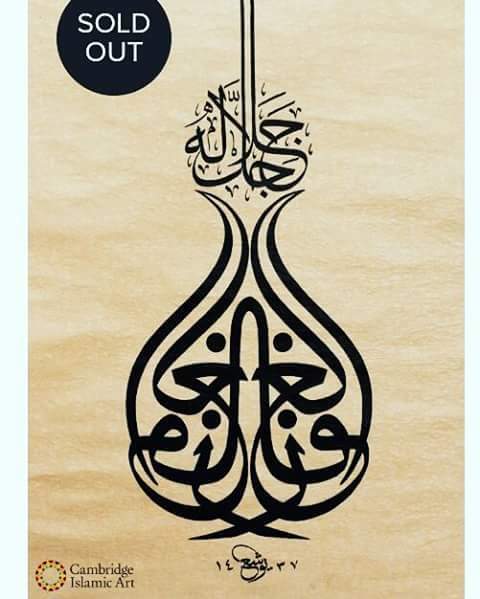 I hope the nib of your Qalam is always wet with ink.